Dr. Thom is originally from Albany, MN. 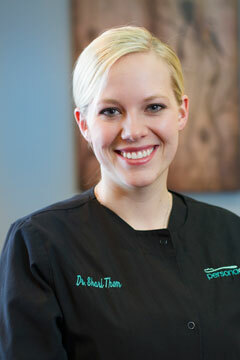 She graduated from the University of Minnesota Dental School with distinction in the top 10% of her class. She has received the Erwin A. Epstein Award for Excellence in Clinical Endodontics and the American College of Prosthodontics Undergraduate Achievement Award. Dr. Thom enjoys camping, traveling, photography, gardening and spending time with her husband, Preston, and their son, Liam. Dr. Thom loves all aspect of general dentistry, and has strong interests in endodontics, oral surgery and prosthodontics. She is excited to work with patients in all age groups as she enjoys interacting with and getting to know each of her patients. She is dedicated to providing her patients with integrity and quality personal care.